A concerned citizen who came across a nest on the ground with eggs in it and an injured mama nearby contacted us via Facebook. The lady wanted to know what she could do to help. She posted pictures to help us identify the bird. Not being familiar with the hundreds of bird species we have here, I reached out to our former Executive Director who not only identified the bird but also shared some interesting information about the species. The bird was a Killdeer. They find small depressions in the ground and build their nests with sticks, grass, weeds, shells or rocks. Their nests can be found in parking lots, golf courses, lawns, athletic fields, etc. Their nests are often overlooked because they are almost level with the ground around it. What makes this bird so fascinating is that females will fake injuries to lure predators away from their nests. As a predator approaches, she will drag herself farther and farther away from her nest continuing to fake her injuries. It’s also been observed that she may roll completely over, pant and gasp for air—all an act. Another tactic they use to protect the nest is by pretending to build a nest. When a predator approaches the real nest, the Killdeer will move away, find a depression in the ground and pretend to be covering her non-existent eggs. As the predator approaches the fake nest, the Killdeer will leave only to repeat this fake-out until the enemy tires of her games and flies away. Sometimes groups of Killdeer get in on the action of chasing away real or perceived predators. The first one to spot the enemy will fly very close to the face of the animal while making a loud, shrill cry as if to be yelling at it. Soon others join in with the same loud cries. In most cases, this is enough to scare anything away. Because Killdeer build their nests on the ground, it can take up to six attempts in a season to successfully hatch their eggs. Pesticides, other lawn chemicals and cats are the biggest threats. 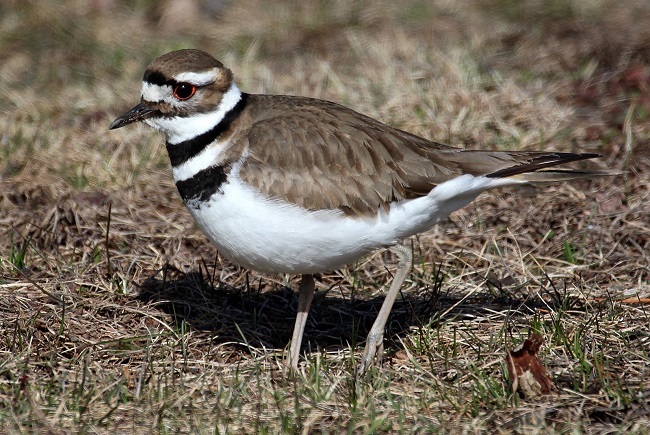 The Killdeer is a member of the plover family. Plover, as defined by the Free Dictionary, is, “Any of various widely distributed shorebirds of the family Charadriidae, having rounded bodies, short tails, and short bills“. Although defined as a shorebird, it’s equally happy in dry or wet locations. It is classified, as migratory but is a year-round resident in most areas of Texas. According to Texas Parks and Wildlife, the Killdeer is one of the noisiest birds in America. Their name was derived from their call—a loud “KILL-DEER”. Nature is amazing, isn’t it?